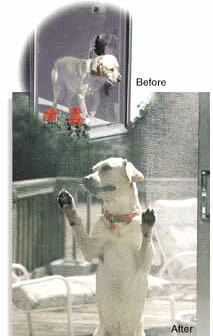 Pet Screen is made of sturdy vinyl coated polyester which is 7 times stronger than the traditional fiberglass and aluminum screen mesh, and resistant to tears and damage that is caused by household pets. Pet screen is sold in full rolls of 100' and in smaller rolls of various sizes for smaller screen repair projects. Standard colors are black and gray. Pet Screen is manufactured in the USA to insure that it is a high quality product, and installs just like standard insect screening. Not sure what size of custom screen you need? Read more about measuring for your custom screen, screen system, or replacement window screen frame here! For all other questions about our custom screens, check out our FAQ page or Contact us! Want more ideas for your custom screens or sliding screen doors? Read our blog!